MMAmania.com resident fighter analyst — and aspiring professional fighter — Andrew Richardson breaks down the mixed martial arts (MMA) game of UFC Fight Night 107’s Jimi Manuwa, who will look to force himself into the title picture this Saturday (March 18, 2017) inside The 02 in London, England. Heavy hitter, Jimi Manuwa, will attempt to land another knockout opposite fast-rising prospect, Corey Anderson, this Saturday (March 18, 2017) at UFC Fight Night 107 inside The 02 Arena in London, England. Manuwa is a smart striker with a good variety of weapons. That said, the factor that stands out far from any other is the insane amount of power packed into just about every strike that Manuwa throws. While on the topic of the clinch, that’s an area where Manuwa does solid damage. Aside from hammering at his opponent’s legs, Manuwa will mix it up and slam knees into the body and head. Overall, he’s not particularly concerned about setting up the perfect shot, as his knees will damage just about anything they touch. On the whole, Manuwa is pretty comfortable from all ranges on the feet. From the outside, he’s active in working his kicks. Manuwa likes to throw switch kicks (GIF), generally to the head or leg, and he’s been better about hiding them as of late. On the outside, Manuwa’s considerable reach is a big factor in landing the knockout. He packs power in both hands, but he definitely hunts for the left hook (GIF). Often, his opponents are circling to avoid the right hand, only to move directly into the hook instead. If they’re circling away from the hook, the right hand is always a dangerous option, but Manuwa will also make use of the left hook-right low kick combination. Opposite Saint Preux, Manuwa used the threat of his left hook to set up the eventual knockout. In this week’s technique highlight, that’s the performance I chose to analyze. Manuwa’s wrestling ability was rather raw entering UFC, as he mostly relied on his athleticism to remain standing. Against more skilled wrestlers with similar athletic gifts, that wasn’t an option, and Manuwa has improved his technical takedown defense in response. For the most part, Manuwa doesn’t really go for takedowns. However, that changed when he felt some of Cyrille Diabate’s long knees aimed at his ribs. After realizing just how good “The Snake” was with knee strikes, Manuwa began to time and catch them, securing easy takedowns from the clinch. While the Frenchman is was never a particularly good wrestler, it was still a nice display of transition and adaption from Manuwa. More recently, Manuwa actually used reactive shots to counter Saint Preux’s offense. He didn’t complete any takedowns, but he did push into good position inside the clinch. Defensively, Manuwa does very well when able to read the takedown. If he sees the shot coming, Manuwa digs underhooks quickly and gets his hips back. From there, he’s a very difficult man to overpower, and Manuwa will immediately go to work with knees from the clinch. For the most part, Manuwa has struggled when opponents set up their shots well. 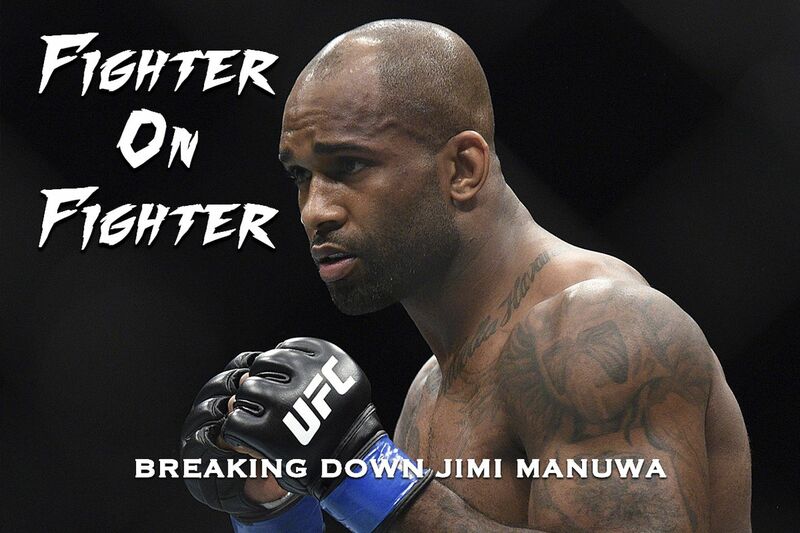 Once in on the hips, Manuwa is not a particularly experienced wrestler, and he struggles more to fight off the shot. On the bright side, Manuwa’s ability to stand from his back and has proven effective. When brought to his knees by Saint Preux, Manuwa kept his weight leaned against the fence while leaning heavily on the overhook. Before long, Manuwa was able to get his feet underneath him and return to the clinch. Manuwa does not often find himself in pursuit of the submission nor has he been seriously threatened at any point. That said, Manuwa has shown some habits on the mat. Manuwa’s sole career submission victory comes via guillotine, in which he did his best to squeeze off the head of some poor out-matched regional fighter early in his career (GIF). The guillotine is often a means of takedown defense for Manuwa, who will latch onto the head and fire off knees will his opponent forgets about the takedown and squirms to escape. This is going pretty far back as well, but Manuwa did show an intelligent half guard in his Octagon debut. In the first round of his fight against Kyle Kingsbury, a slip landed Manuwa on his back in half guard. From this position, Manuwa did a very good job securing an underhook and working for an opportunity to return to his feet. While waiting for his chance, Manuwa created space by attempting to come up into a single leg or roll the opposite direction. These two sweeps, while basic, are very effective at every level of grappling, and they eventually allowed Manuwa to come up to his knees and then stand. In short, Manuwa understands his fundamentals well enough to avoid getting in trouble, but don’t expect the Englishman to play high guard from his back or show anything too complex. This is a massive opportunity for Manuwa. Light Heavyweight’s title picture has no clear contender following the upcoming rematch of Daniel Cormier and Anthony Johnson, meaning anyone who scores an impressive win is “in the mix.” Indeed, if Manuwa can score a second straight knockout, he may find himself in title contention sooner than later. Andrew Richardson, a Brazilian jiu-jitsu purple belt, is an undefeated amateur fighter who trains at Team Alpha Male in Sacramento, California. In addition to learning alongside world-class talent, Andrew has scouted opponents and developed winning strategies for several of the sport’s most elite fighters. Matt Hughes Teases Comeback; Is Georges St-Pierre His Target?